I found this recipe via Pinterest last year and it’s been a staple ever since! It makes an enormous amount of salad, so I generally make it when I’m planning on feeding a few people – while it does do well in the fridge to eat the next day/later in the week, I personally prefer salad to be fresh. I’ve made it before when hosting friends for wine night at my house and it was a huge hit! I get really bored eating the same lettuce every time I make a salad, so this is a wonderful alternative for those days you need to mix it up. The almonds, bacon and cheese add more texture and flavor, making it a lovely entree salad. It really fills you up! While a mandolin is recommended for this recipe, it is certainly not required. 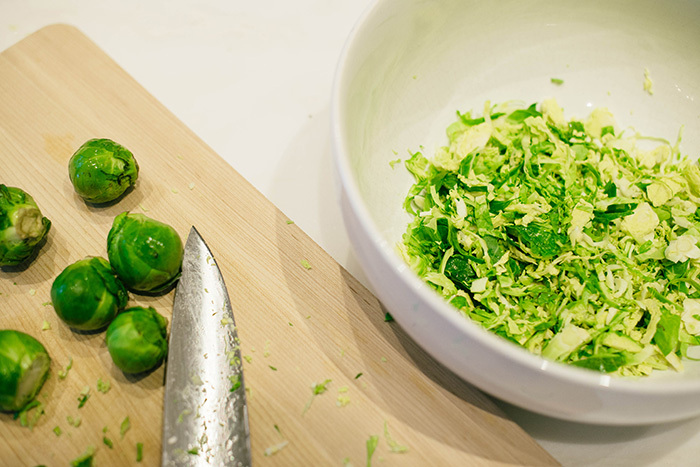 A mandolin will help slice those Brussels sprouts a little quicker (and a little more precisely), but you can do just as good a job with a sharp knife – it’ll just take you a little bit longer. I’ve made this salad both ways, and it really didn’t make a difference in the final product. Be sure to check out more of my recipes here! 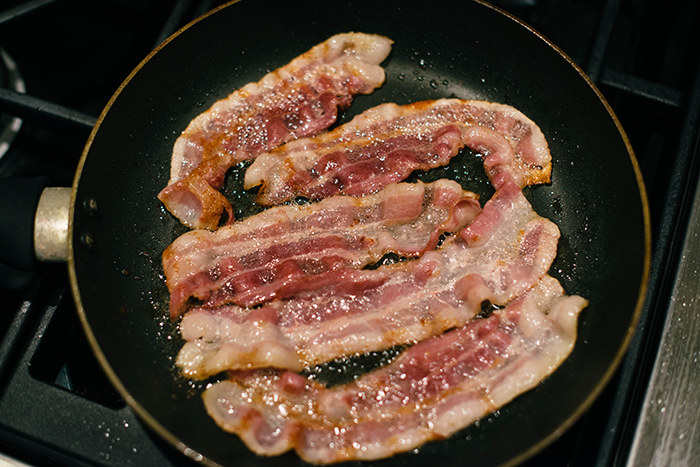 Cook and crumble your bacon – I prefer mine a little less crunchy, but cook for however long you like! 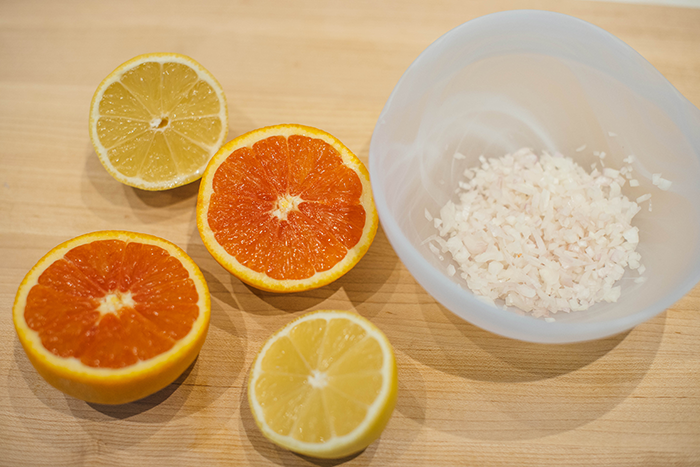 Squeeze the juice from the orange and lemon into a bowl with the minced shallots. 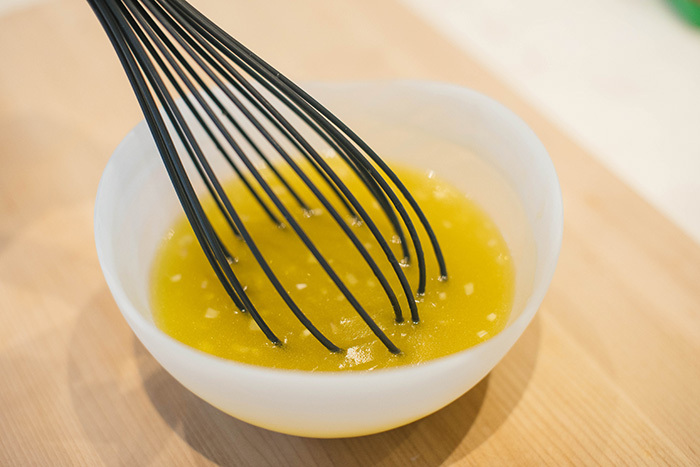 Pour the olive oil in a steady stream, whisking as you go. The mixture should become more cloudy and less clear as you whisk. Add salt and pepper to mixture. Cover and place in your fridge until you are ready to serve the salad. Rinse your Brussels sprouts well before using your mandolin (or sharp knife) to create thin slices – it should look like some sort of slaw texture. Place all slices into a large bowl as you go along. Next, place your almonds into a food processor and churn until the almonds are coarsely chopped. 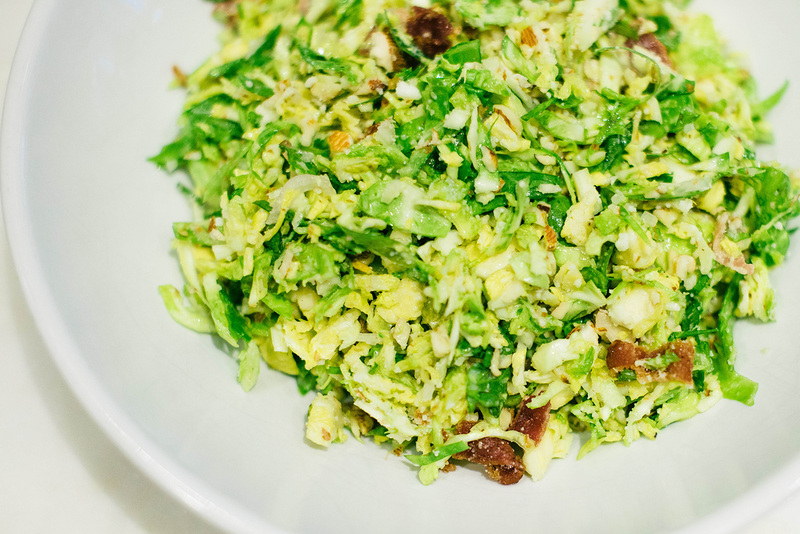 Add 3/4 of the almonds, cheese and bacon to the Brussels sprouts bowl and mix up. 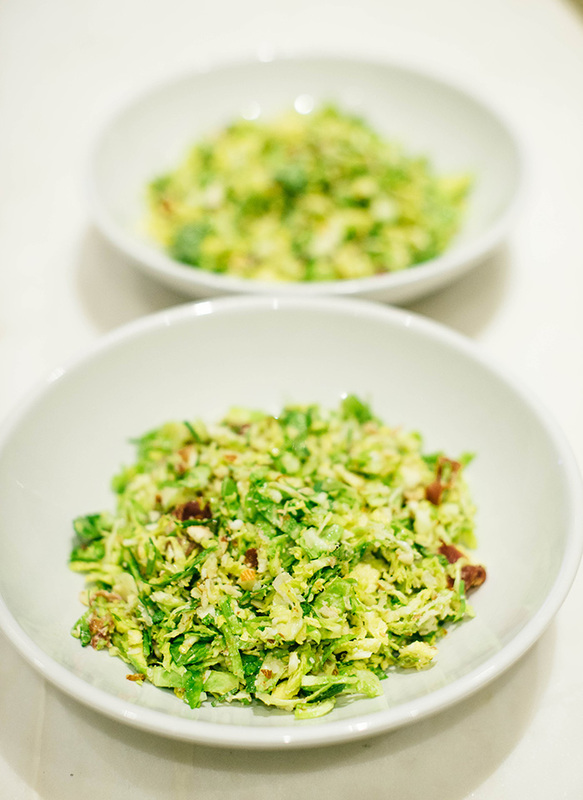 At this time, grab your dressing and pour over the Brussels sprouts mixture. Toss until completely coated. Finally, place a generous serving of salad onto a few bowls and top with the remaining cheese, bacon and almonds for garnish. Serve and enjoy! Looks delicious, Mer! I love brussel sprouts. bacon and brussels sprouts are literally two of my most favorite things. THANK YOU. Thanks for sharing this recipe. I just made it for lunch and it is so good! I only used two dozen sprouts but kept the citrus juice amount and the bacon the same.